The classic preparation is poached skate with beurre noisette, or brown butter. It can be time-consuming, depending on whether you go for the traditional route. For example, some prefer making a fish fumet which will then be used as the poaching liquid. Sautéing is an easier and quicker method. Cooked in this manner, skate wings develop a wonderful flavor and have a firm, meaty texture. Season skate wing generously with salt and pepper. Pour milk over fish and set aside for 10 to 15 minutes. Spoon flour onto a plate. Lightly dredge skate on both sides. Gently heat oil in a large skillet. Add the skate wing. Fry three minutes on each side until golden brown. Transfer the fish to a warmed serving platter. Melt butter in a sauté pan over medium heat until it begins to brown, about 3 to 4 minutes. Quickly whisk in vinegar, capers, lemon juice and parsley. If you wait too long, the butter will burn so you’ll want to have the ingredients at the ready. Pour the brown butter sauce over the skate and serve at once. If skate is unavailable, substitute sole, flounder or halibut instead. 04 May	This entry was published on May 4, 2010 at 2:10 am. It’s filed under food, general and tagged brown butter, capers, dinner, fish, French cuisine, quick and easy, seasonal and local, skate. Bookmark the permalink. Follow any comments here with the RSS feed for this post. I simply cannot believe you are NOT the owner and Famous Chef of one of NY’s finest restaurants. The foods you create, including this latest one, looks like a masterpiece. 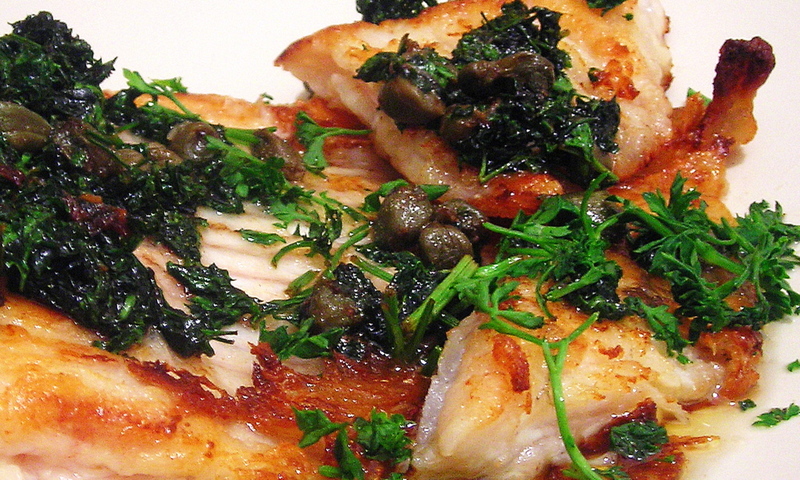 Capers and Fish DO belong together………….. as always, thanks for inspiring me.